As previously mentioned, my soon to be five year old son, NHL, asked for a dinosaur cake with a volcano on it. Rather than run and hide, I decided to make it . In my last post, I showed how I sculpted the volcano shape from our giant cupcake mold. It was not too horrible, but the real challenge would come in finding the right decorating tools to make it really look like a volcano. We bought whipped milk chocolate frosting to go on the complete outside of the volcano mountain. I have found that the whipped variety spreads much easier. In addition to this, it works nicely in my decorating tools if need be. 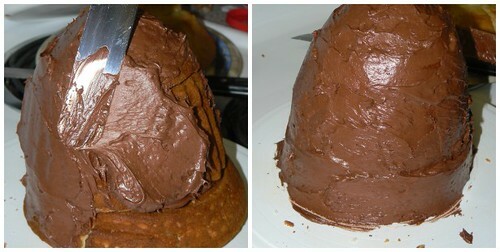 Below is what it looked like after covering the volcano shape completely with this frosting. Please note that JL and I were acting like kids. We quickly realized what the cake also looked like and did impressions of Mr. Hankey. 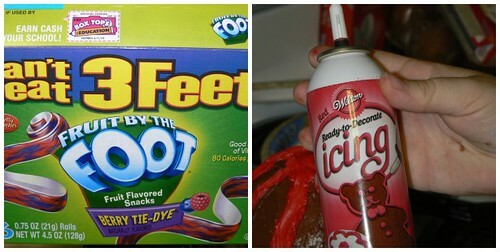 Since we were unable to locate plain strawberry Fruit by the Foot I tried the Berry Tie-Dye one. It did not work! The red icing was set up using the star tip and I was ready to go. As you will see, a volcano was quikly born. Once this was done I made the cupcakes to take to NHL’s birthday party with a friend that was today. 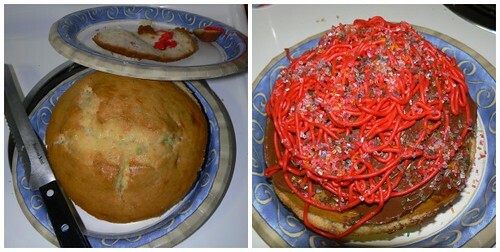 I used the extra red icing and some sparkle sugar sprinkles. Photos of those to come with details of the party. I also decided to use the remaining chocolate frosting to make the excess giant cupcake remnants into something more pretty. Here is a before and after. Next Friday I will bake another giant cupcake, freeze it until Sunday to take to NHL’s family party where I will construct another volcano with dinosaurs around it, officially naming it Mount Dinocake! 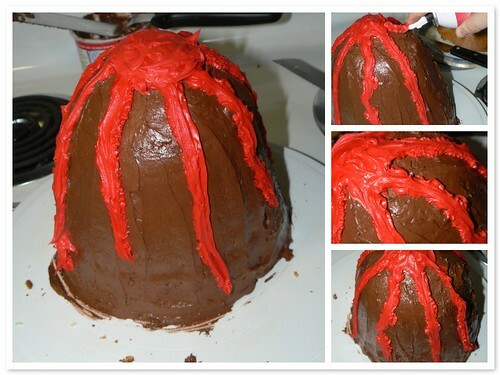 For now my project is to figure out how to get this volcano cake to JL’s work on Monday. At least that is the plan now. Another cake adventure! You are such a good Mommy for doing these great cakes. The Mr. Hankey thing make me laugh! Cake adventures are great! My 3 year old wanted a monster truck. You’ve inspired me, I should post pictures of the before and after of that one. I think we did ok.
Wow. You’re an amazing mama! ha! we love mr hankey – such a funny song. great cake! where in NY are you? i’m coming to manhattan in oct! How cool! Those cake requests ;) Looks like you really rose to the challenge!